After my review of the Samsung Galaxy Tab S3 I think it is the best android tablet right now. But it’s quite expensive at over 500 dollars. There are a lot of cheaper but still good competitors out there. One of the most interesting alternatives is the ASUS ZenPad 3S 10 which is a lot cheaper at around 270 dollars. It was released last year with a very good build quality, a similar 9.7 inch display and premium features like a fingerprint reader. I already reviewed the ASUS ZenPad 3S 10 right after it was released in September last year. While I don’t own the tablet anymore I used the chance at Computex 2017 to compare it to my Samsung Galaxy Tab S3. Let’s take a closer look at these two competitors. Let’s start with the design and build quality. Both tablets are 9.7 inches and have a nice design. With the Galaxy Tab S3 we’re getting an aluminum bezel but the back is made out of glass. That looks and feels quite high end but also attracts fingerprints easily. The ZenPad 3S 10 on the other hand has a full metal body – it feels very high end as well. Thanks to the full metal body I like the build quality of the ZenPad 3S 10 a bit more. It’s just over 1mm thicker though at 7.15mm. The Galaxy Tab S3 is a bit thinner at 6mm. Both tablets have nice speakers that are built into the sides. They offer a very nice sound quality. While the ZenPad 3S 10 has two speakers with DTS HD Premium Sound the Galaxy Tab S3 offers four speakers that are developed together with AKG. Both offer a nice experience but the speakers of the S3 are a bit nicer. The ports are very similar. Both feature a USB Typ C port, a microSD card slot and an audio port. Both also have a fingerprint reader integrated into the home button so you can unlock the tablets safely and easily. Above the 9.7 inch display are 5 megapixel cameras which can record 1080p videos and are nice for videochat over Skype or similar apps. On the back of the Galaxy Tab S3 sits a 13 megapixel camera though while the ZenPad 3S 10 only has an 8 megapixel camera. Samsung is also offering us the ability to record 4K video which the tablet from ASUS is not capable off. Let’s take a closer look at the displays. Both feature a 9.7 inch panel and both have a very high resolution at 2048 x 1536. Texts and icons look very sharp and they are perfect for watching movies over Netflix or playing games with nice graphics. It’s a matter of preference but overall I like the display of the Galaxy Tab S3 a bit better. Samsung is giving us a very nice Super AMOLED panel with high contrast and nice blacks. The ZenPad 3S 10 has a nice LCD panel, but the one from Samsung looks a bit better. But as I said, that’s a matter of taste. Some like AMOLED displays and some do not. Both tablets have pretty good hardware underneath their displays, but we’ll see a clear winner here. Samsung and ASUS are both offering 4GB of RAM which is quite a lot. We’re getting twice as much internal storage with the ZenPad 3S 10 at 64GB though. But the processor is weaker in my benchmark tests. While the Galaxy Tab S3 is shipping with a Qualcomm Snapdragon 820 octa core SoC, the ZenPad 3S 10 has a MediaTek 8176 hexa core processor. As you can see in my benchmark comparisons the tablets get very similar results in Geekbench. But the Galaxy Tab S3 is a clear winner in AnTuTu with roughly double the points. I played a lot of games on both devices including Modern Combat 5 and Asphalt 8 Airborne. I didn’t notice any problems or lags with both tablets. You’re also able to use the Chrome browser with a lot of tabs open without any problems or edit pictures in Lightroom. But if you want as much performance as possible the Galaxy Tab S3 will be the tablet for you. 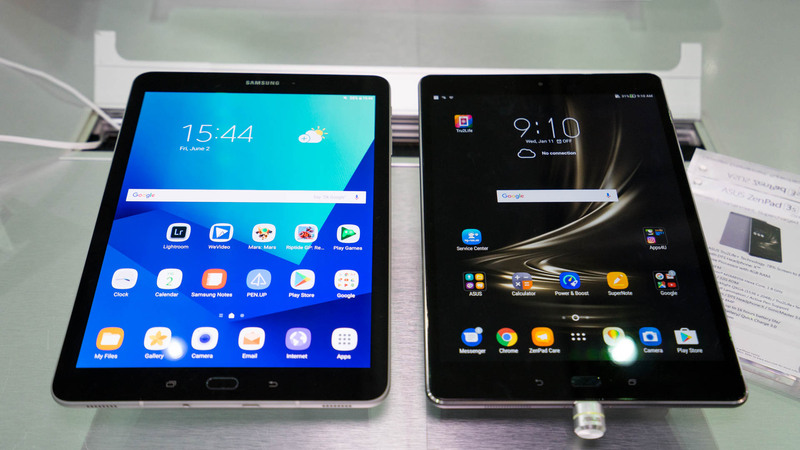 The Samsung Galaxy Tab S3 is directly shipped with Android 7.0 Nougat while the ZenPad 3S 10 was released with Android 6.0 Marshmallow. At Computex I already saw the tablet from ASUS running Nougat though and in fact a couple of owners already got an update. That’s great. But the Galaxy Tab S3 is newer so it’s very likely that it will get updates for a longer time, especially since Samsung is quite good at providing updates for their high end models. Both manufactures customize the UI quite heavily. While Samsung is using TouchWiz ASUS has their own UI called ZenUI. Which one is better? Well, everyone likes something different so it’s hard to say. On first sight TouchWiz looks a bit cleaner but you can also declutter the ZenUI easily. The preinstalled apps are very similar as well. Both offer a note app for example, both have energy saving modes and thanks to Nougat both offer a split screen view. It really depends on what you prefer – or you just install any launcher of your choice. A lot of people might be getting the Galaxy Tab S3 because of the included S-Pen stylus for handwriting or drawing. But Samsung is not the only one who offers an active pen – in fact ASUS has their own one called ASUS Z Stylus. It’s not included so you have to buy it separately. I like the S-Pen a lot but I never had the chance to try the Z Stylus so I’m not in a position to do a real comparison between these two. What’s quite interesting though is that both offer similar software features, ASUS even has something similar to the Air Commands. If you look at the technical aspects only Samsung is the winner though. The S-Pen does not require a battery and has four times as many pressure points at 4096. So if you really want to use a stylus than the Galaxy Tab S3 is probably the way to go. Both have a pretty similar battery. While the ZenPad 3S 10 has one with a capacity of 5900mAh the Galaxy Tab S3 has a battery with a capacity of 6000mAh. The battery life of Samsungs tablet is longer at 12.5 hours though. In my battery test the ZenPad 3S 10 lasted 10.5 hours. The reason for the longer battery life of the S3 is probably the Super AMOLED display. To get relatively comparable results I always do the same battery test by running an HD video over and over again until the tablet shuts itself off. Brightness is always set to 50 percent, WiFi is activated and there’s a notification coming in occasionally from Gmail. No apps like Facebook are installed though. Alright, as you can see in my comparison I think the Samsung Galaxy Tab S3 is the better tablet. It has an excellent display, a very nice performance and the battery life is longer too. I like the build quality of the ZenPad 3S 10 a bit better though thanks to the full metal body. But as I mentioned in the beginning the Galaxy Tab S3 is quite expensive. In fact if you’re looking for as much tablet as possible for as little money as possible I would recommend the ASUS ZenPad 3S 10. Sure you have to make some compromises, but actually not that many. You’ll also be saving roughly 230 dollars. Refer to Displays section: It’s “matter of preference” not “madder”. Please correct.